This book talks about evangelism, thought. 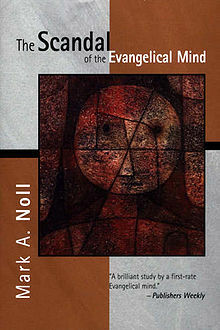 The scandal of the evangelical mind is that there is not much of an evangelical mind. So begins this award-winning intellectual history and critique of the evangelical movement by one of evangelicalism's most respected historians. Unsparing in his judgment, Mark Noll ask why the largest single group of religious Americans who enjoy increasing wealth, status, and political influence have contributed so little to rigorous intellectual scholarship in North America. In nourishing believers in the simple truths of the gospel, why have evangelicals failed at sustaining a serious intellectual life and abandoned the universities, the arts, and other realms of high culture. Noll is probing and forthright in his analysis of how this situation came about, but he doesn't end there. Challenging the evangelical community, he sets out to find, within evangelicalism itself, resources for turning the situation around.